South Khorasan Province is a province located in eastern Iran . Birjand is the centre of the province . The other major cities are Ferdows , Tabas and Qaen . In 2014 , it was placed in Region 5 . This new province , is but the old Quhistan which was included into greater Khorasan in the Iranian administrative planning . However , historically Qohistan forms a separate entity , with a distinct culture , history , environment and ecology . 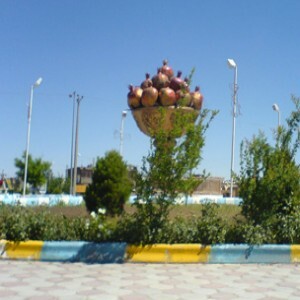 South Khorasan is one of the three provinces that were created after the division of Khorasan in 2004 . While at the beginning , the newly created "South Khorasan" included only Birjand County and some new counties detached from that county (i.e. Nehbandan , Darmian and Sarbisheh) , in subsequent years , all northern and western cities and territories of the old Quhistan (such as Qaen, Ferdows and Tabas) have been annexed into the South Khorasan . South Khorasan Province consists of 11 counties : Birjand , Ferdows , Tabas , Qaen , Nehbandan , Darmian , Sarbisheh , Boshruyeh , Sarayan , Zirkouh and Khusf . Greater Khorasan has witnessed the rise and fall of many dynasties and governments in its territory throughout history . Various tribes of the Arabs , Turks , Kurds Mongols , Turkemen and Afghans brought changes to the region time and time again . Ancient geographers of Iran divided Iran ("Iran-Shahr") into eight segments of which the most flourishing and largest was the territory of Greater Khorasan . Esfarayen , among other cities of the province , was one of the focal points for residence of the Aryan tribes after entering Iran . The Parthian empire was based near Merv in Khorasan for many years . In Parthians times , Esfarayen was one of the important villages of Nishapur . During the Sassanid dynasty the province was governed by a Spahbod (Lieutenant General) called "Padgoosban" and four margraves , each commander of one of the four parts of the province . Khorasan was divided into four parts during the Muslim conquest of Persia , each section being named after the four largest cities , Nishapur , Merv , Heart , and Balkh . In the year 651 , the army of Islamic Arabs invaded Khorasan . The territory remained in the hands of the Abbasid clan until 820 , followed by the rule of the Iranian Taherid clan in the year 896 and the Samanid dynasty in 900 . Mahmud of Ghazni conquered Khorasan in 994 and in the year 1037 Toghrül , the first of the Seljuq empire rulers conquered Nishapur . Mahmud Qaznavi retaliated against the invaders several times , and finally the Qaznavi Turks defeated Sultan Sanjar . But there was more to come , as in 1157 Khorasan was conquered by the Khwarazmids and because of simultaneous attacks by the Mongols , Khorasan was annexed to the territories of the Mongol Ilkhanate . In the 14th century , a flag of independence was hoisted by the Sarbedaran movement in Sabzevar , and in 1468 , Khorasan came into the hands of Tamerlane and the city of Herat was declared as capital . In 1507 , Khorasan was occupied by Uzbek tribes . After the death of Nader Shah in 1747 , parts of it were occupied by the Afghans for a short period . During the Qajar period , Britain supported the Afghans to protect their East India Company . Herat was thus separated from Persia , and Nasser-al-Din Shah was unable to defeat the British to take back Heart . Finally , the Paris Treaty was concluded in 1903 and Iran was compelled not to challenge the British for Herat and other parts of what is today Afghanistan . Finally Khorasan was divided into two parts : the eastern part , which was the most densely populated region came under British occupation , and the other western section remained part of Iran . Khorasan was the largest province of Iran until it was divided into three provinces on September 29 , 2004 . The provinces approved by the parliament of Iran (on May 18 , 2004) and the Council of Guardians (on May 29 , 2004) were Razavi Khorasan , North Khorasan , and South Khorasan . The major ethnic groups in this region are the Persians aswell as sizeable ethnic Balochs population . South Khorasan is known for its famous rugs as well as its saffron , barberry which are produced in almost all parts of the province . South Khorasan has many historical and natural attractions , but besides these , South Khorasan encompasses various religious buildings and places of pilgrimage as well . The Cultural Heritage of Iran lists 1179 sites of historical and cultural significance in all three provinces of Khorasan . In the past , Birjand was a small part of Qohestan . Qohestan is now located in the South Khorasan province . The main cities of Qohestan were Toon (now Ferdows) and Qaen . Birjand grew in recent centuries , especially during the Qajar dynasty and found its important role in this region . This region was a place of refuge for some movements like the Ismaili , and was the target of Arab refugees who escaped from the tyranny of the Abbasid caliphate . Zoroastrian vestiges also exist in the area . and 260 other sites of historical and cultural significance , as listed by Iran's Cultural Heritage Organization .